Rhinestone Personality Collection is made of high-quality leather designed for great looks, and to be used as an everyday collar/leash. 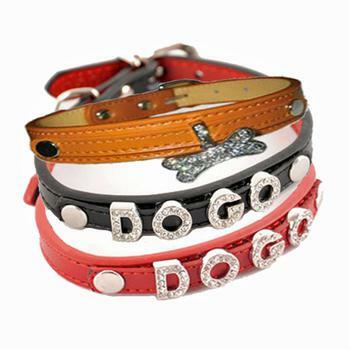 Each collar and leash can be customized by you with our bling rhinestones. Just slide it on and put the belt in place; it can be done in less than a minutes! WHEN ORDERING TEXT YOU MUST ADD THE LETTER COUNT AMOUNT TO CART OR YOU WILL NOT RECEIVE THE LETTERS.